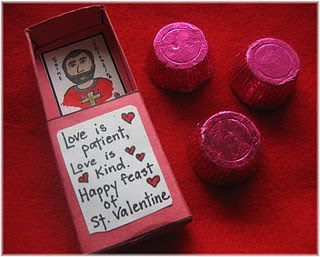 Here are some more ideas for celebrating St. Valentine’s Feast day. little history! Print it here. See more Saint Valentine crafts, or see the all of my Valentine’s day ideas. 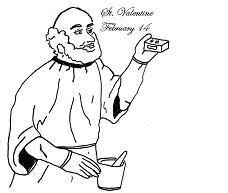 In the coloring page of St. Valentine above, what is he holding in his left hand??? (I’m assuming the right hand has a mortar and pestle to represent him being a healer?) But we can’t figure out what that is in his other hand. Anyone??? The link goes to “Church of the Good Shepherd”…can you please post the correct link for the history and the coloring page. We would really appreciate it. We love your website, keep up the good work. In answer to the question about what St. Valentine is holding, I believe it is one of his “prescription medicines” in a box. Possible link to “chocolates in a box” as present day gifts? ?